health problems for our companions. An overweight pet is at considerable risk. Diabetes: defects in insulin secretion, including high blood sugar. Heart Problems: heart disease, congestive heart failure, and high blood pressure. walking may lead to pain medication which carries its own risks. Torn ACL: torn ligaments can only be repaired by surgery and requires pain medication for pain management. Anesthesia Risks: heart and lungs in particular have a harder time functioning properly during surgery while under anesthesia, risking sleeping too deeply, or sometimes, not deep enough. They may also have difficulty waking from anesthesia. Infections: higher risk factor for infections, may require antibiotics. Heat Stroke/Exhaustion: extra weight interferes with the body’s ability to auto regulate. Cushings Disease: a malfunction of the pituitary gland and can include excessive thirst/urination. Skin Problems: rashes, body odor, scratching and infection by bacteria. Shortened Life Span: too much weight can reduce a pet’s life span by as much as 2-years or more if the pet has been overweight for a considerable time. 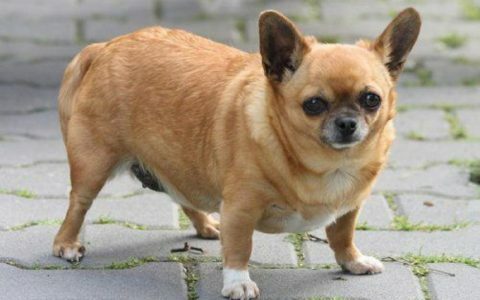 Loss of Quality of Life: an overweight pet tires easily and is less likely to play, and will experience sadness. Or, you can check out the numerous articles at petmd.com, pethealthnetwork.com, purina.com, dogfoodadvisor.com, PetCareRx.com, K9magazine.com, and chewy.com. There is even a Dog Breed Chart for ideal weight range at PetCareRx.com which you can download or print as a reference. Purina did a 14-year study which concluded dogs fed and kept at or near an ideal weight lived 1.8 years longer than their overweight canine friends, confirming the need to keep our pet’s at a healthy weight so they can stay active longer. Fortunately, this is a health condition which can be corrected. Yes, it will involve more exercise for both you and your pet, but this allows more time you can spend with your pet doing fun activities such as walking, throwing frisbees, or how about an agility course for your dog? You get to run it, too. Now that you are aware of the DANGERS your dog (or cat) is facing, commit to make the necessary changes to improve the quality of your pet’s life. Hopefully, this article will give you the motivation to act soon. Making changes now can add years back to your pet’s life. 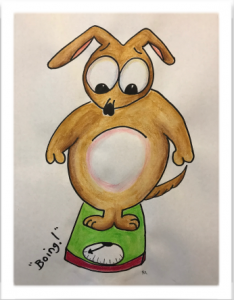 Before starting any diet or exercise routine, please consult with your veterinarian to develop a weight-loss program tailored to your dog’s (or cat’s) specific needs. It may involve changing the food you are currently feeding, including treats and rewards. graphic which best describes your pet’s body condition. The same technique is also used for determining the weight category for a cat. view. You should be able to feel the ribs then a nice tuck for the waist, and it should be visible from a side view. If your pet falls within the ‘too thin’ bracket, you can do better for your pet by increasing the amount of a good nutritional food they receive. You still need to watch out for unhealthy snacks, but you can replace those with yummy things like cooked cubed chicken, blueberries, yogurt or carrots. If your pet falls within the ‘ideal’ bracket, Congratulations! You’re doing a great job! However, if your pet falls within the ‘too heavy’ bracket, it is time to make a change. Your veterinarian may refer to this as ‘obese and clinically obese.’ A rating of a 6 or 7 is very worrisome. My pets have always seen their veterinarian at least twice a year for an annual checkup. One spring, following a long, cold snowy winter, I took my boxers, Morgan and Mindy, for their checkups. Imagine my surprise when they were several pounds overweight. How could that be? I watched nearly every bite that went into their mouths and still they gained weight. Hmm, could it be those doggy treats? They ring the bell to go potty, get a treat. Go outside and potty, get a treat. Learn a new command, get a treat. Play find the toy, get a treat. All those empty calories added up, and a harsh winter meant limited playtime outdoors. You get the idea: eat a cookie, a bag of potato chips, a hot dog, or a sandwich and you give a bite to your pet. The kids drop food on the floor and your pet cleans it up. You toss dog treats to your pet without a thought to how much food they have already ingested and they gobble it up. They have been trained to follow your every move because there could be food involved somewhere. We are all guilty of feeding our pets table scraps or ‘just a little taste’ of our food. Often, we are not even aware we are doing it, but we need to be. After several admonishing comments and a few raised eyebrows, Dr. Bob told me to change what I used as a treat. Now all my pets receive healthy treats like cooked cubed chicken, yogurt with applesauce and a few kibbles sprinkled on top, diced carrots, blueberries and small amounts of broccoli and cauliflower in moderation. It’s much healthier for our pets and a good reminder we should be eating healthy, too. 🍎 Eliminate table scraps; choose a fruit or vegetable instead. 🍎 Talk more walks; add indoor exercise by playing a challenging game, include jumps or stair climbing. 🍎 Speak with your veterinarian about a holistic diet and exercise plan. 🍎 When giving treats and rewards, be sure to include the amount into your calculations so you don’t overfeed at meal time. Remember, it took a while for those pounds to pack on. Be realistic with your goals to help your pet lose weight. Take it slow and those few changes will begin to have wonderful results. You and your pet will be glad you made the change.